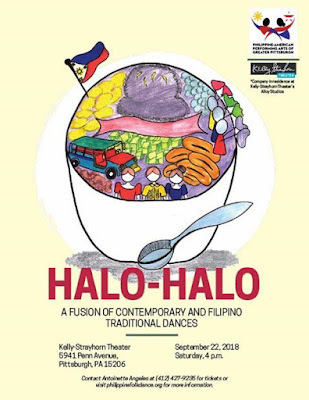 PennsylvAsia: Philippine-American Performing Arts of Greater Pittsburgh recital "Halo Halo" at Kelly-Strayhorn Theater, September 22. 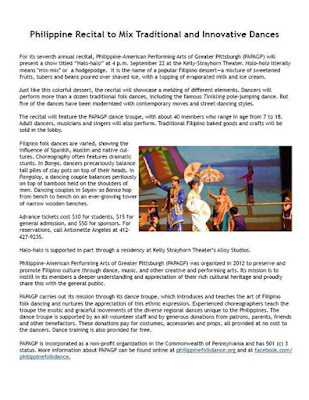 Philippine-American Performing Arts of Greater Pittsburgh recital "Halo Halo" at Kelly-Strayhorn Theater, September 22. The Philippine-American Performing Arts of Greater Pittsburgh will present its seventh annual recital on September 22, a show called "Halo Halo." Halo-halo literally means "mix-mix," or a hodgepodge. It is the name of a popular Filipino dessert---a mixture of sweetened fruits, tubers and beans poured over shaved ice, with a topping of evaporated milk and ice cream. Just like the colorful dessert, the recital will showcase a melding of different elements. Dancers will perform more than a dozen traditional folk dances, including the famous Tinikling pole-jumping dance. But five of the dances have been modernized with contemporary moves and street-dancing styles. 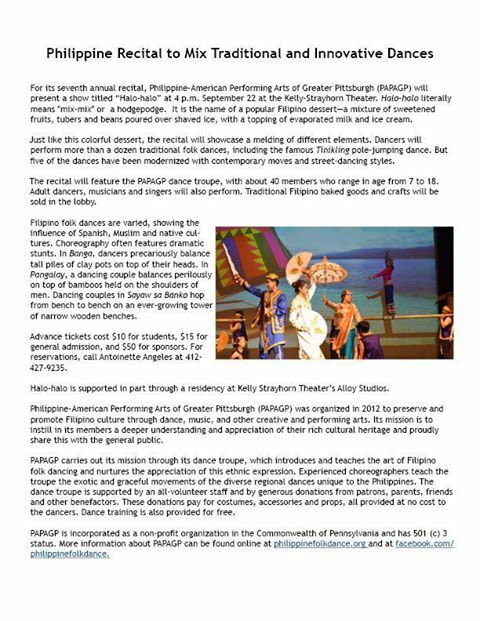 The show starts at 4:00 pm at the Kelly-Strayhorn Theater at 5941 Penn Ave. in East Liberty (map). Tickets are in a "Pay What Makes You Happy" format, and are available online.